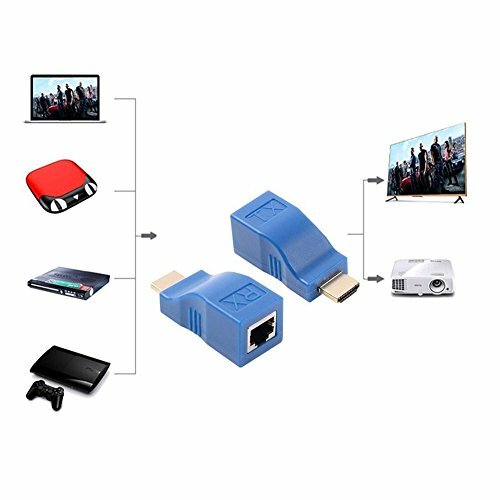 Description: This kind of HDMI Extender by CAT-5e/6 cables use only one of CAT-5e/6 cables to extend the HDTV display up to 30 meters for 1080p, This Adapter not only breaks the limitation of the HDMI cable transmission length, but also has more flexibility and convenience in cable construction. 1. One pair as full functional module, no need of setting. 2. CAT-5e/6 cable can substitute HDMI cable to achieve long distance transmission. 3. Follow the standard of IEEE-568B. 4. Transmission distance can be up to 30 Meters for 1080p using CAT-6 cable. 6. No need for extra power supply. CAT-5e/6 cable can substitute HDMI cable to achieve long distance transmission. Follow the standard of IEEE-568B. Transmission distance can be up to 30 meters for 1080p using CAT-6 Cable. Compact size. Support highest video resolution 1080p.